The bulky package of Skinny Cow Milk Chocolate Dreamy Clusters makes you think you’re eating a bigger, more filling treat than the calorie panel would suggest. My first experience with a Skinny Cow product was their tiny little frozen dessert single-serve cups, and it was downright terrible. With the first spoonful, I instantly regretted picking it over the tiny tubs of Häagen-Dazs in the same cooler. In the quest to find decent calorie-reduced treats, there are successes and there are failures; that Skinny Cow experience was most definitely a failure. Ah, but I’m a sucker for punishment, and I wasn’t deterred enough by my first Skinny Cow experience to forever steer clear of the brand. 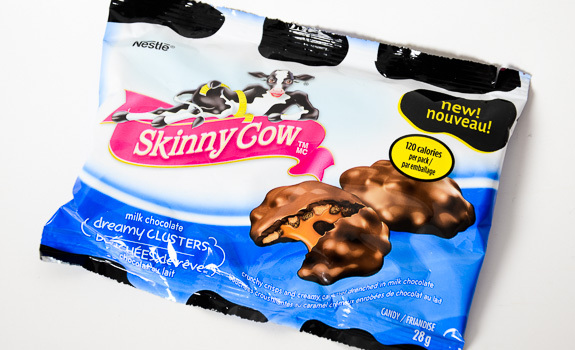 And wouldn’t you know it – I’m glad I gave Skinny Cow a second chance, because these Dreamy Clusters are a wonderful example of how, when done right, a calorie-reduced snack treat can actually nail the compromise. The Look: The commercial on TV had me believing these were basically low-calorie Turtles, and the illustration on the package shows roughly the same thing, complete with gooey caramel flowing between the two halves of a split apart chocolate lump. In reality, there are about five or so smallish (between the size of a quarter and a loonie) chocolate-coated lumps in every bag, and they look nothing like Turtles – or the illustration on the front, for that matter. The packaging and name both scream “I’M ON A DIET!” – I guess that’s cool if you don’t mind proclaiming your diet intentions to anyone within sight. The Taste: Once you get past the “Um, these aren’t like Turtles at all” shock, they’re really not that bad. They’re chocolate coated rice crisps, with a bit of chewy caramel inside. The sweet to salty ratio is just right, there’s a satisfying crunch and each piece is just the right size. There’s some psychology going on here, too: the chocolate lumps look bulkier because of the rice crisps, and the number of pieces per package makes it feel like a more substantial treat. The chocolate tastes fine, and the caramel adds the extra kick that takes it from OK to quite good. Reduced-calorie snacks are always about the compromise between flavour and cutting calorie corners. In this case, the right cuts were made. The packaging and television commercial makes these look like Turtles. 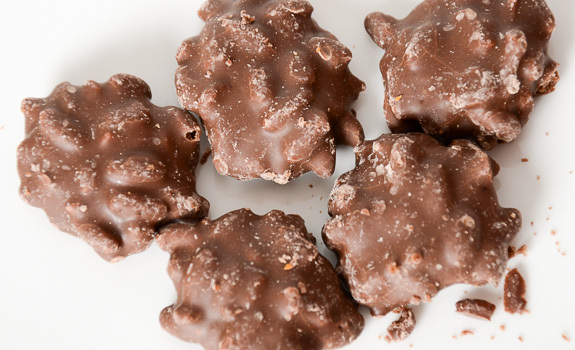 In reality, they look like chocolate-covered clusters of something or other. They get all scuffed up in the package, too; I sampled several packages, and all contained equally worn-looking treats. Cost: $1.25 for a 28 gram bag at Calgary Co-op. (Also spotted and purchased at London Drugs for $0.99. Value for cash money: Good. About the same price as a chocolate bar. Nutrition? : Per bag (28 grams): 120 calories, 6 grams of fat (including 0.1 gram of trans fat, FWIW), 100 mg of sodium, 2 grams of fibre, 1 gram of protein. The verdict: That these are tasty is only half of the awesome. The real victory is that when you eat a pack of these, you feel as satisfied as when you’ve just eaten a regular-sized chocolate bar, which often contains twice the calories. That’s harm reduction I can get behind.